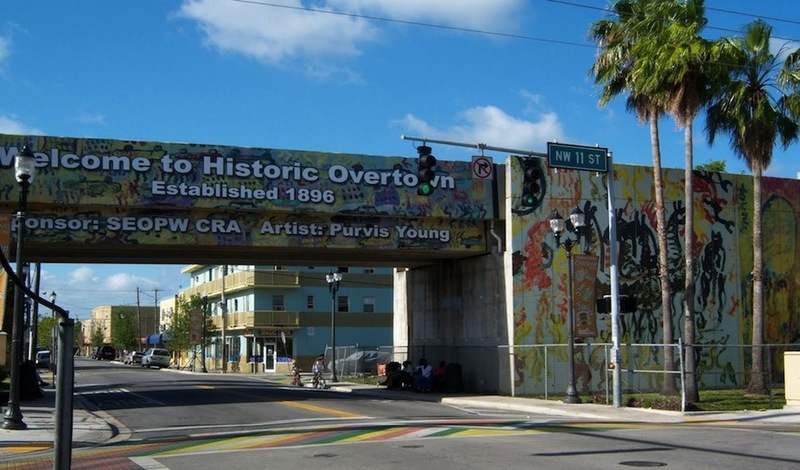 Beyond the constant roar of Interstate 95 and the scattered detritus of an era long forgotten, there are the brightly painted wall surfaces done by the late artist Purvis Young. 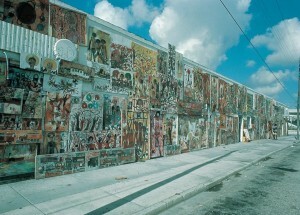 The African-American artist, born in 1943, lived and worked in Overtown until his death in 2010. Many Miamians consider this neighborhood on the north end of downtown to be a crime-ridden slum, forgetting (or maybe not knowing) that it was once a thriving community for Miami’s African-American population. 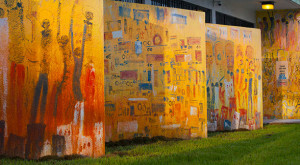 Young’s four decades of vivid art throughout Overtown has connected this faded past with contemporary urbanization. Growing up, Young received a minimal elementary education and never went to high school. In his late teens, he spent three years in jail for breaking and entering. It was during this time that he reconsidered his lifestyle and decided to pursue the fine arts. He began drawing and was inspired by the art books he read. 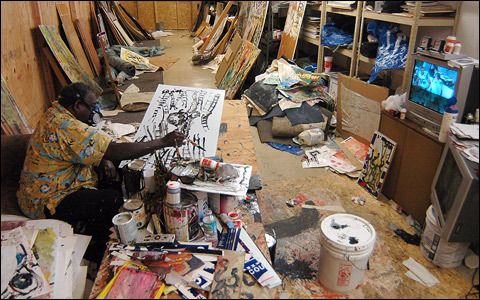 After prison, he returned to Overtown in the 1960s and spent hours at the historic Dixie Park Branch Library (now the Culmer/Overtown Branch Library), studying the works of such artists as Rembrandt, El Greco, van Gogh, and Delacroix. Armed with this self-taught knowledge, Young began his artistic career in the early 1970s. He painted on unconventional materials including cardboard, discarded doors, table tops, and plywood. 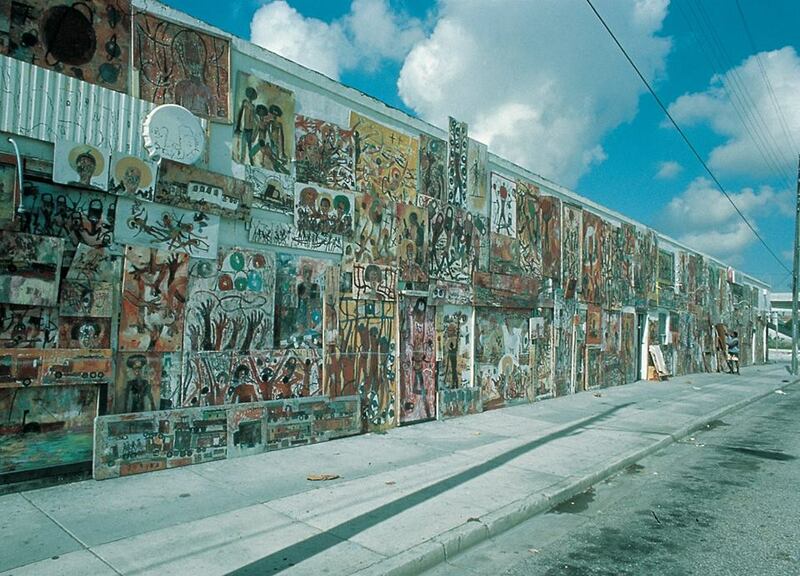 One of his earliest works was the Goodbread Alley mural, done in 1972, where he nailed his paintings to the sides of three abandoned buildings in Overtown at the intersection of Northwest Third Avenue and 14th Street that were visible from the expressway. Young was inspired by the “Freedom Walls” of Chicago and Detroit that were painted by artists of the Black Arts Movement. 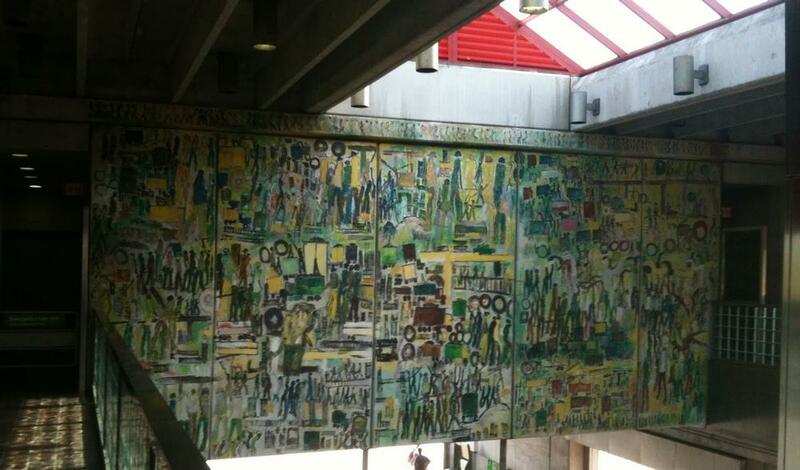 Unfortunately, the Goodbread Alley mural was destroyed in 1975 to renovate the buildings for new housing projects. 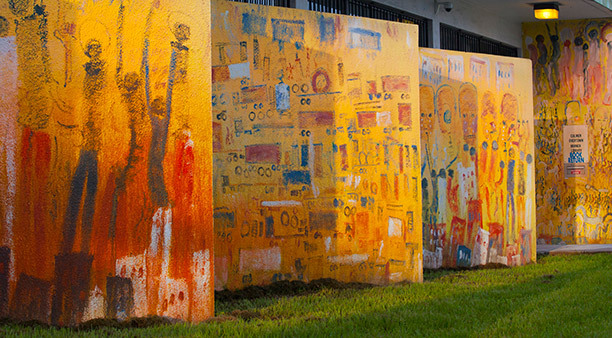 Other public art installations by Young include Everyday Life (1984)—the painted outside walls at the Culmer/Overtown Library; the mural at the entrance of Miami Dade’s Northside Metrorail Station (1986); and the 3rd Avenue StreetScape Project located along the east side of the Miami/Overtown I-95 corridor (2010). Young’s admiration for literature and the arts lead him to an early commission by Miami Dade County. Visions of the Street (1983) was a painted mural on the auditorium’s walls at the old main public library in Bayfront Park. 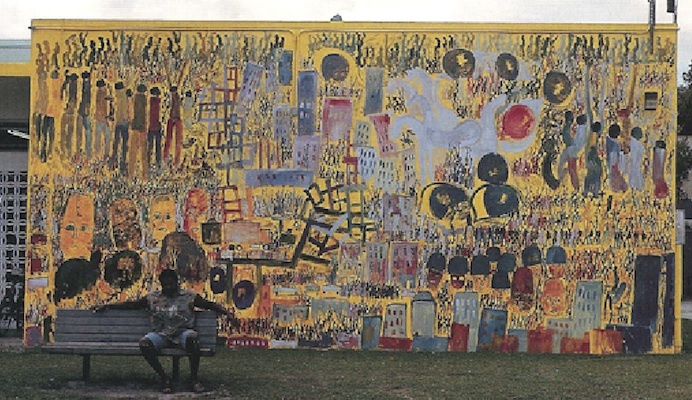 However, the building, along with the mural, was destroyed after the library was moved to the Cultural Center Flagler Street location in 1985. Young’s loose-hand brushstrokes include colorful figures, often in crowds, with horses, large floating heads, angels, trucks, trains, and railroad tracks. For the artist all these images suggest freedom, hopefulness, the goodness of humanity, and escape juxtaposed with the harsh realities of Overtown’s rundown neighborhood. In 2006 a thirty-year retrospective exhibition on Young opened at the Boca Raton Museum of Art. His work is part of many permanent collections such as the Bass Museum of Art in Miami Beach; the Corcoran Gallery and the Smithsonian American Art Museum in Washington, DC; the High Museum of Art in Atlanta, Georgia; and the Philadelphia Museum of Art. This entry was posted on Friday, February 14th, 2014 at 5:49 pm and is filed under Audio, Overtown, Photo Galleries, Preservation, Videos, YouTube Video. You can follow any responses to this entry through the RSS 2.0 feed. Both comments and pings are currently closed.